*Note: this recipe is for a large batch of sprouts, but if you’re making dinner for a smaller crowd, just adjust the recipe slightly! You can buy pancetta or lardons in smaller packets, and leftover chestnuts can be added to soups, salads, or even shop-bought stuffing to give it some extra texture. Trim the sprouts and slice in half, lengthways through the stalk. Boil the sprouts for around 4-5 minutes, then drain and set aside. In a large bowl, mix together the pancetta and chestnuts with the olive oil, then add a pinch of salt and a twist of black pepper. Add the sprouts and mix until everything is coated, then spread out onto a large baking tray. Roast at 220C/200C fan for around 30 minutes, or until the bacon is crispy and the sprouts turn golden. Oven getting a little crowded on Christmas Day? If you’re short on space, this recipe can be adapted to a frying pan or wok as well. 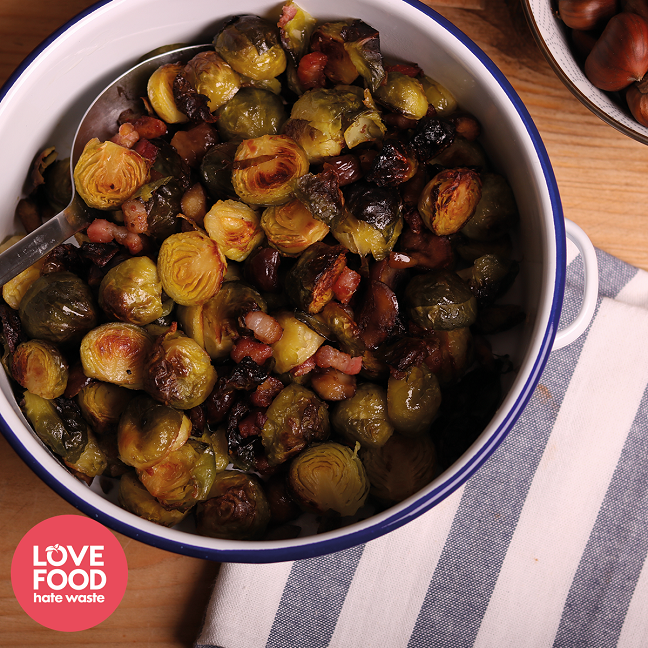 Simply fry the bacon and chestnuts in the oil, add the par-boiled sprouts and season, then fry on a medium heat until crispy and golden.